Children lead the Albany council and audience in the Pledge on Wednesday night. The Albany City Council wants to allow kids within the city limits to raise piglets for 4-H, but getting there is proving a little more contentious and time-consuming than anticipated. Councilor Floyd Collins brought this up on Monday. He had been approached by a North Albany mother whose children hoped to start raising a couple of pigs this spring and sell them at the 4-H auction this summer. Problem: The city code prohibits swine inside the city limits. As the council had suggested Monday, an amendment to the city law on keeping animals came up at Wednesday’s regular session. 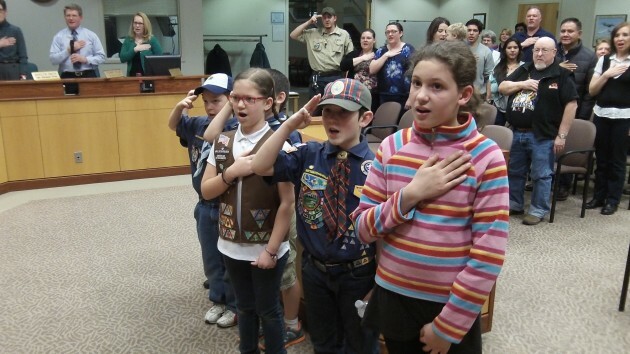 It looked promising when the 4-H kids and some others in Scouting uniforms led the council and audience in the Pledge of Allegiance, garnering benevolent smiles all around and an encouraging word from Mayor Sharon Konopa. The kids had long left — a school night, after all — by the time the council got around to the pig amendment. It would allow two pigs to be kept on any lot of one acre or more, as long as the animals are under 7 months of age, are kept for “educational purposes,” and are not kept for longer than 4 months in any 12-month period. There’s more: The piglets thus allowed would have to be kept in secure pens at least 25 feet from the property line. And, their keepers must get written approval from all property owners within 300 feet. The worry, as the council’s discussion made clear, is that a place might otherwise become a big stinking pig sty. Also, pigs being smart, they might get loose and cause havoc. Presumably with this in mind, Councilor Bill Coburn proposed to add a sunset clause. The pig ordinance would expire after one year unless the council renewed it. But in a vote, his colleagues shot this down. Instead Sean Kidd, the assistant city attorney, proposed that the ordinance be phrased so that it would automatically renew every year unless repealed by the council. But Jim Delapoer, the senior city attorney, said that’s the case with all city laws: They stay in effect until repealed. In the end, no action was taken other than to have Delapoer recite the title of the ordinance. The required second “reading” will happen at the next regular meeting March 9. After that, assuming it’s adopted, the law change will take 30 days to take effect. That’s unless the council adds an emergency clause. The version considered Wednesday had none. Pigs are people too…just like trees. Pigs lives matter! Given this is the Albany City Council, they are probably sniffing around for more revenue. I smell a pig tax coming. So just say that the 4H piglets are pets. For crying out loud a pet rat is still a rat. Also I seem to remember when N. Albany was annexed to the City, Steve Bryant (then City Manager) said that the City would “maintain the rural atmosphere” of the area.